Gateway Crate and Freight provides mobile, on-site and off-site packing, crating and shipping services to commercial and residential customers. We have the experience and expertise to professionally package, custom crate, pickup, store, move, ship and deliver a wide range of commodities and materials from any place to anywhere. The key to any successful shipment is in protecting the items during the move. Correctly packing a box, crate and container or properly palletizing boxes on a skid can be the difference in the product or items being damaged and them arriving safely. Utilize our custom packing service for your commercial products, household goods or fragile and valuable items. Gateway Crate and Freight is a Veteran owned business and is a member of the Wooden Crates Organization, Customized Logistics and Delivery Association (CLDA) and the International Warehouse Logistics Association (IWLA). Shipping to any destination from any destination. Gateway Crate and Freight is a federally licensed Motor Carrier (MC-917143-C) that performs pickup, delivery and short line haul with our own equipment. As a licensed Broker we also utilizes an advanced network of transportation providers to ensure we can offer our customers a number of different shipping options. 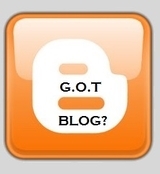 Our Gateway O.T network consists of a multitude of independent short and long haul truck drivers, contracts with Less than Truckload carriers (L.T.L) parcel carriers, Air passenger and Air Cargo carriers, Ocean Lines and Rail companies. International or domestic shipping for residential and commercial customers. We have experience in trucking full truckloads and partial loads called L.T.L shipments as well as standard parcel shipping with the U.S. Postal Service (U.S.P.S), United Parcel Service (U.P.S), Federal Express (FedEx) and a number of regional parcel distributors. Need your shipment there fast? Try our Air Freight services. Want to save a little money and in no rush? Gateway Crate and Freight can ship ocean cargo containers as well as partial ocean shipments called L.C.L as well as rail freight and intermodal shipping. Gateway Crate and Freight has a pack and ship facility in multiple locations across the U.S. If you have any questions or need help with packing, moving or shipping send us an email info@gatewaycrateandfreight.com or give us a call toll free at 1-855-474-4685. A lab facility in Phoenix was closed down and its machinery and assets needed to be sent to its other facilities around the world. We crated and packed 37 different large, heavy but delicate machinery pieces for destinations like Singapore, Taiwan and Vietnam. When crating and packing, it is important to remember that all W.P.M (Wood Packing Material) must meet international certification standards. The WPM for all materials is regulated by the IPPC. All W.P.M must be Heat Treated, Kiln Dried or fumigated with Methyl Bromide. To ensure compliance, each country issues a certification number to each facility the meets the standards of the IPPC and then is authorized to make crates and provide packing in compliance with these international regulations. Gateway Crate and Freight is a certified facility (License US-20468). This series of pictures is the packing, wrapping, blocking, bracing and crating of a table and lab equipment going to Singapore. We take great care in the pickup, packing, crating and shipping of all valuable equipment in our care. You need to ship International? Do you need to properly protect your items shipping out of the country via air or ocean, give our experts a call 480-966-0795 or toll free 855-474-4685. Computer and data processing equipment requires the right packaging especially when the equipment carries live data. 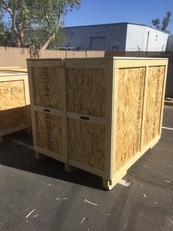 Gateway Crate and Freight has crated, packed and shipped numerous data processing devices. Including entire data warehouses and call centers. This was a smaller job but important none the less. These 6 data servers had to be packed to sufficiently protect the data. We use E.S.D wrap, it prevents Electrostatic Discharge from damaging the computer drives. E.S.D occurs during shipping when packaging rubs on exposed metal connected to the circuit boards in the computer. We used 2" and 1" T-Lam foam to reduce vibration during transport. Shipping on Air Ride equipped trailers makes a difference too in protecting sensitive equipment. Our shipping services always take into account how a package should ride. We always want to use the appropriate equipment to get the job done right. If you have computer data equipment you need picked up packed and shipped give us a call for a free estimate. 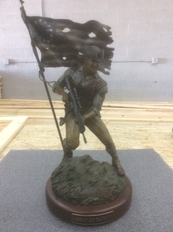 Gateway Crate and Freight has been packing and shipping a number of Bronze statues lately: Horses, an eagle and this patriotic bronze statue all this week. We take great pride in packing and blocking and bracing these works of art, although the bronze itself is pretty sturdy some of the marble and wood bases and connections can be fragile due to the weight and size of the piece. That's why we use plenty of t-lam Foam under and around the base. The one inch gray foam you see under the base absorbs the vibration in transit. We then fit the base into a 2" T-Lam foam to secure the wood/marble base into place while providing a soft strong cushion. The bronze is then held into place with some foam padded 2 X 4's. This secures the bronze in place while shipping, holding the base in the foam and preventing the bronze from touching the sides of the crate. We run a 1 X 4 stapled cleating around the plywood to give it a firm lock for all the walls. We always palletize bottom our crates to ensure that the crate can easily be moved by material handling equipment. This artist brings all of his statues to us, he knows that his hard work is well protected. He also relies on us to ship his items. We have shipped his statues across the country and around the world. If you have one of a kind statuary or a valuable piece of art, give one of our art packing and shipping experts a call to get a free quote. We ensure shipping success by crating, packing and shipping your items above and beyond carrier specifications. We packed, crated and shipped these Personal Effects to Kuwait. This included clothes, camera and laptop among other things. The process of moving personal effects worldwide is not a problem but you have to make sure you have a very detailed inventory list of the items you are shipping. The key to keeping down the cost of any International shipment is the size. Gateway Crate and Freight makes every effort to pack items so that they are protected and secured from each other, while trying to create the smallest footprint possible. This shipment was less than 1 CBM and weighed 137 Kilos. Its footprint in inches was 28 X 45 X 40 all the items wrapped, boxed and then stacked and the crate pallet bottom. Its like playing Tetris, making all the items fit into the best configuration possible. Once we like our size we shrink wrap the boxes together, in this instance we applied a V.C.I plastic wrap around the shipment before attaching the walls of the crate. Needing Packing for Household Goods going out of the country? Give us a call 855-474-4685. We professionally package, crate and ship many pieces of artwork over the course of a year. In terms of quantity, framed oil paintings (in glass or just canvas), are the most requested artwork item we are asked to protect. 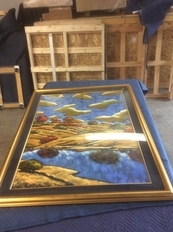 In this shipment we had both a glass and canvas painting shipping together. The owner of the artwork wanted the best protection for these works of art. We picked up, packed, custom crated and shipped these paintings to their new home. For all glass covered paintings we apply a cross of masking tape adhered to the glass. In case the glass breaks or cracks the masking tape is there to keep the glass together, its if the glass starts to separate, that damage like scratching can occur to the painting. So the tape is more of an added level of protection for the painting. We bubble wrapped and shrink wrapped this painting after the masking tape was applied to the glass. Although these paintings were riding on foam, the bubble and shrink wrap combination helped add more protection to the painting and glass frame. We also added a custom cut piece of cardboard to the back to keep the hanging wire from puncturing or damaging the canvas, although this is the back, the wire without this separation could end up penetrating the canvas and damage the front if left without protection. The paintings are then crated with 1" EPS foam (Polystyrene) between each one and around the crate. Gateway Crate and Freight uses an EPE foam (Polyethylene) for the top and bottom. The difference is in the way the foams protect items like glass. You need a more flexible foam that reduces shock and vibration on the bottom and top which you get from the EPE. On the sides you want the paintings to stay firm in position so we utilized the EPE. Many Galleries and Artists rely on Gateway Crate and Freight to pickup, pack, crate and ship their valuable paintings. Give us a call for a free quote. We do a lot of work for Surplus Companies here in Arizona. These companies sell online some pretty interesting machinery and specialized instruments. Some of these items the Surplus Company is not even sure what the machine does but somehow the sell it online. 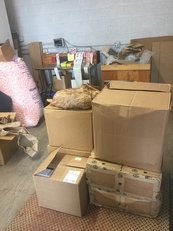 The Surplus company that had us crate, pack and ship this item, has had us pack and ship their domestic and international sales items for quite some time. Sometimes they know exactly what an item is and what it does and sometimes they say 'I'm not really sure what this machine does". They did know that this particular shipment was a Chromatography instrument, we had packed and shipped a very similar machine for them before. Gateway Crate and Freight crates, packs and ships delicate instrumentation all around the world. Our December shipment of the month is a big Thank You to all the Surplus companies who have counted on us to professionally pack and ship their valuable online commercial sales this past year. Custom crafted trade show crates take time and great care in delivering a quality long lasting product. Understanding the trade show environment and the rigors of cross country or over borders transportation is necessary in designing crates that are functional and durable. These crates were designed based on custom requirements of a large Tile company who needed to safely transport show booth exhibit materials, tile flooring and slabs to multiple trade shows. The need to safely transport numerous sized items for a number of shows required we understand the needs of each item and design crates that are easy to use for the trade show personnel but strong enough to handle a good amount of weight. The first picture on the right shows a custom A Frame mounted onto a solid 2 X 6 slated base. This platform also is made as a four way base so that a pallet jack or forklift can enter from both the length or the width. The stringers have an offset at the bottom that allows the wall to sit on the base. This allows us to create a wall that interlocks with the base and other wall. There is also an offset in the 1 x 4 cleating which crates an interlocking system when both walls are set on the base. The larger slabs of tile travel on the A Frame inside the crate. Easy removal of the walls (the walls are not screwed on like most crates) allows access to the larger heavy slabs from each side of the platform. When the walls are interlocked ratchet straps are used to keep the unit together and on the platform rather than screws. Personnel at the trade show will need no special tools like a cordless drill to get the walls on or off. To make the job of un-crating and crating the materials at the trade shows even easier we added custom routed handles to the walls where it would make it easier to remove and replace the walls by providing a great pickup point. By routing these types of handles into the crates cleating we eliminate the risk of having hardware handles damaged or knocked off during transportation. We use many different methods of providing handles and hinged walls for expo and trade show crates, however in this case, easy access to heavy materials made removing the walls the best option for these materials. Because tile flooring is so dense the wall framing needed to be solid. We designed the inner 2 X 4 framing to sit and interlock on the platform base while at the same time allowing the 1X4 cleating on the outside to interlock as well. This added strength and durability to these crates. If you have an upcoming Trade Show or Expo and need help designing the right reusable crate for your materials give us a call. You may not need something as elaborate as interlocking wall shells for your items, but a good quality crate is important for any show. To see a list of trade shows we have helped our clients attend visit our trade show page or give one of our trade show crating or shipping professionals a call Toll Free 855-474-4685 for a free professional consultation to make your next trade show a success.